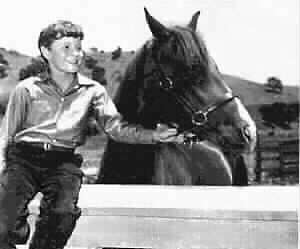 My Friend Flicka with Johnny Washbrook as Ken, was filmed at a ranch in Montana as well as the studio ranch. 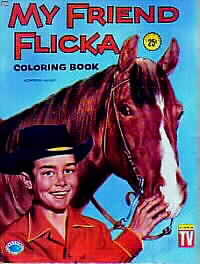 Flicka received the award of excellence in 1958. 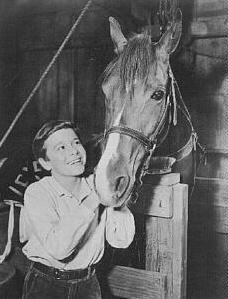 The shows were based on the story books written by author Mary O'Hara which are partly true to her life style living on a ranch in that era. Flicka means little girl in the Swedish language. Comments and info from: Gary M.
Flicka ( real name Wahama WAHANA ) was played by a 900 lb. 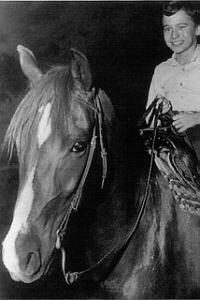 chestnut mare (pure Arabian) who played the animal lead in the TV series 'My Friend Flicka" was trained by Les Hilton. 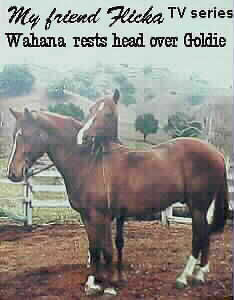 Wahama WAHANA 's stunt double was a quarterhorse-type gelding named Goldie. With the passing of the popular western actor Gene Evans in 1998 in Tennessee, the original cast members (Gene, Anita Louise and Frank Ferguson) are all gone. 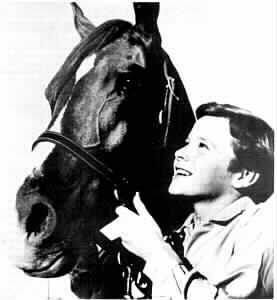 That is, except for the popular auburn-haired juvenile star, Johnny Washbrook, who played Flicka's owner Ken McLaughlin. However, his whereabouts are somewhat of a mystery. His family took him back to their native Toronto, Ontario, after the series folded). I'm sure there are thousands of 'baby boomers' who remember meeting or seeing him during the '50s, as he made many personal appearances during the show's hey-day. I remember meeting him at one such appearance at Belmont Amusement Park in San Diego and hearing of him appearing in the annual Mother Goose Parade there as well. The series was originally filmed in color, on the Fox Western Street and The Fox Ranch in Malibu Canyon, and debuted in 1955. In recent years, the series could still be seen on The Disney Channel, and is probably played in some areas even now. Wherever you are, Steffi and Johnny, we hope you are well. were Stephanie "Steffi" Epper and Goldie. Steffi is related to John Epper and Tony Epper veteran stunt men. The entire Epper family worked in stunts. Well, I have a happy update for you. I've located Johnny Washbrook. John said he was really extremely fond of the horse, whom everyone referred to as 'Flicka". For some reason, she was not supposed to give birth due to some condition, and after the series she was sold to a rancher, who in turn sold her again. While in the care of the next owner she apparently became pregnant and died, tragically. Flicka was at Fat Jones Stables, where Les Hilton worked with her. My own horse Jim did the free jumping scenes (out of a corral, etc) for Flicka TV. I doubled the mother in that series. Subsequent research has found that one of your contributors was correct, TV's Flicka was originally named Wahana, not Wahama as I reported back in 2000. She was last kept at a ranch in New Mexico. She had been foaled in Newhall, CA in 1950. 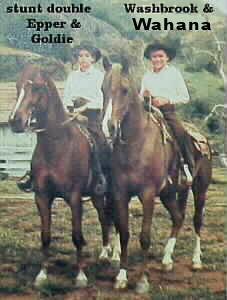 Her double 'Goldie' had been recruited from a racetrack in Mexico where she was working as a lead pony. Johnny Washbrook ('Ken McLaughlin') will do his first celebrity apearance since he was a boy at the 'Gathering of Guns' of the 2009 Memphis Film Festival, 4-6 June, in Olive Branch, Mississippi. 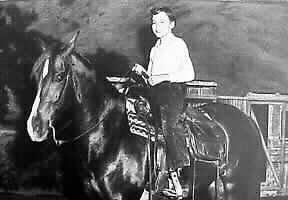 Date: October 2008 I have managed to gather and verify the following information on Wahana (Flicka): Registered Name: Wahana (Abu Farwa x Mehana) Registration Number: AHR*6513 Foaled: June 13, 1950 Bred by: W. P. or Josephine Hawley Progeny: Hanabu, AHR*20389 (Arabian Stallion) foaled March 11, 1961 Ross Flicka, HAHR*1A26719 (Half Arabian Mare) foaled March 16, 1962 Arabian Horse Association Owners of Record: Patrica Ann Eaves (June 13, 1950) Frances Saueressig (July 6, 1967) Seeing that Wahana had two foals for Ms. Eaves it would appear that the comment stating that she died giving birth to a foal is inaccurate. It appears that Wahana was put up for sale in 1967 (presumably from the death of Patricia Ann Eaves) and was purchased by Frances Saueressig who died in 1984. I have been trying to determine when Wahana died and where her final resting place is. It is possible that Wahana's remains may be interred in New Mexico on the property where the Ms Saueressig resided when she owned Wahana. DATE: APRIL 2009 As mentioned in my October 2008 post she also had two foals and was purchased as a 17 year old in 1967 so the report of her not being able to be bred and dying while foaling is also likely erroneous. For the past two years I have been trying to find out everything I can about Wahana and such information has been difficult to come by. If I may be so bold as to point out that Goldie, Wahana's stunt double was a 'he' not a 'she'. Close visual examination of several of the TV episodes validates this. It would would be wonderful to be able to have a dialog with Mr. Washbrook to see how much he remembers about her. I'm saddened to report that indeed Flicka (Wahana) died tragically in 1968 trying to birth her third foal after being bred to a Quarter Horse stallion Tonto Bars Hank. I am working with Gary M and Mr. Drury attempting to determine her final resting place. To discover this has broken my heart for I have fallen deeply 'in love' with Flicka. Those that met/interacted with her were blessed beyond their wildest dreams. Burial:Non-Cemetery Burial Specifically: Buried at an unknown site, possibly/most likely on the Saueressig's (her owners' 500- acre Hal-Fran Ranch) near Hermit's Peak, northwest of Las Vegas, New Mexico. AHA records show that she foaled a grey Arabian stallion, Hanabu (AHR*20389), whose sire was Habu (AHR*9378) on March 11, 1961, and a chestnut half-Arabian mare, Ross Flicka (HAHR*1A26719) who was sired by a non-Arabian stallion named Wazat on March 16, 1962. Patricia Eaves is shown as the breeder for both of these foals. In July of 1967, presumably after the death of Ms Eaves, Flicka was purchased by a Francis Saueressig of Santa Fe, New Mexico and taken to her and her husband Harold's Properties in New Mexico. There is no official record of her death, as it was never reported to the Arabian Horse Association. Current investigation reveals that Flicka died during foaling for the third time after being bred to the Sauressig's champion racing Quarter Horse Tonto Bars Hank with the foal dying within days afterwards. Based on her date of purchase by the Saueressigs, that she was likely bred sometime in July or August of 1967, and the 11-month gestation period for horses, her death was likely sometime in June or July of 1968. John Washbrook has said that at one time he was told that Flicka had died with foal. This story pre-dates a similar report from a different source. She may have been buried on the late Saueressig's former ranch (Hal-Fran Ranch) near Hermit's Peak, northwest of Las Vegas, New Mexico. Our (myself and Gary M) hope is that there is a marked grave site where a memorial might be erected. Flicka was a beautiful light in the world and I owe a deep debt of gratitude for her influence in my life. I recently was able to track down and contact the corporate CEO who is the current owner of the former Hal-Fran Ranch in New Mexico, where it was believed that Flicka might be buried. In the more than two decades that he has owned it, he says that he has been over the entire property and has not seen a marker or any depression or anything else that would indicate a burial site. However, in the two previous decades before his purchase of the property any trace of the burial site may have smoothed out to hide any trace. He now has my contact information in case he comes across anything in the future.